Who says you cannot have the perfect legs without exercise? Sounds ridiculous? Not if you know the concept of airbrush and its techniques. For beginners, this refers to the process of digitally altering a face or portrait. An airbrush gun and the colours of your choice are required to start off this interesting process. Enrol for airbrush makeup course in Chennai and learn the fine nuances of creating picture-perfect models for photo shoot. This makeup system makes use of an airbrush instead of a sponge. The colours in the airbrush are mixed together when a blast of air is supplied. Imagine the droplets as fine particles of colour that can be applied to brides, models and for daily use. The tools can be intimidating, and with the right expertise and guidance, you can start applying makeup like a pro. 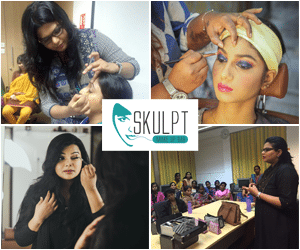 You can sign up for any Academy’s airbrush makeup classes in Chennai and learn how to come up with the perfect look for oily skin that will last all day long. If you have envied Moulin Rouge for her soft complexion and bright eyes, chances are the photo has been airbrushed. Experts teach you how to apply water-resistant makeup that shows no signs of its presence on your skin. Less time is required– with the traditional liquid makeup, you can conceal a wrinkle or enhance the existing features. This method can be used anywhere- for brides or models and regular use makeup. Another benefit is its longevity. No number of tears, sweat or water can mess up with the makeup. HDTV – Fashion and Bollywood are incomplete without this latest technology. This method has been the first choice when it comes to smudge-proof and long-lasting makeup. Bride’s choice– These days, every bride prefers the airbrush makeup method than the conventional style of brush and layers of foundation. The former gives the bride a soft, dewy and a natural-looking complexion that matches the skin tone. Used for cover-ups: They can be used to camouflage skin conditions like wrinkles and acne. You do not have to worry about clogged pores and damaged skin, as several skin care specialists recommend this makeup for patients with chronic skin conditions. Suitable for all skin types– Unlike conventional makeup, an airbrush makeup is best suited for all skin types. To get started, you require an airbrush, compressor and the colours or the makeup set. Air is passed through the nozzle that releases droplets of fine colour onto the face. If you intend to apply foundation, few drops are sufficient for a natural look. Hold the device at a distance of 6 inches away from your face and apply in circular motions. Keep your hand steady and repeat this process on the other side of the face.